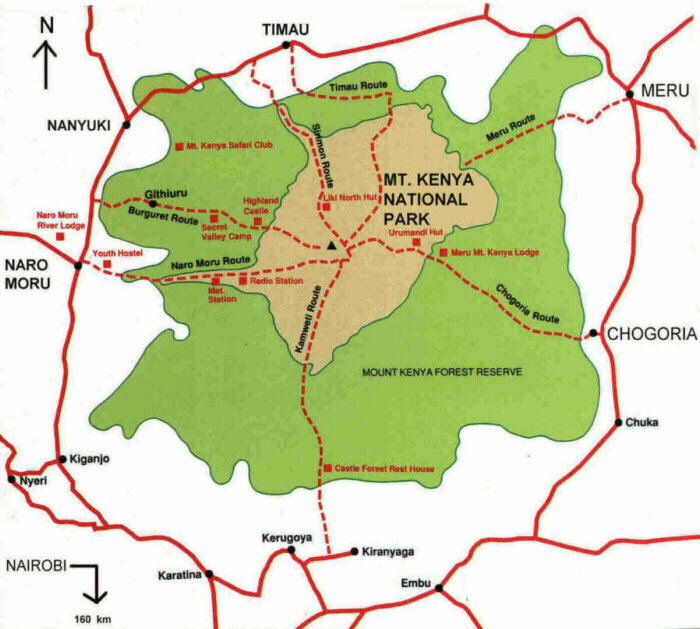 Transfer from your hotel in Nairobi and drive to Naromoru Gate (alt.2700m). On the way enjoy the picturesque views of the white highlands and the sprawling Aberdare ranges. After a picnic lunch, start an acclimatization hike up the forest vegetation arriving at the Met Station lodge (alt.3050m) in the late afternoon. Dinner and overnight at the camp. Depart after breakfast and start the hike of the moorland vegetation enjoying the spectacular mountain valleys. Lunch on the way, later hike up to arrive at the Mackinders Camp (alt. 4300m) in the early evening. Dinner and overnight at the camp. After breakfast, hike further up the rocky area enjoying the picturesque views of the Two Tarn and the Oblong Tarn to arrive at the Shiptons Camp (alt.4200m) in the early afternoon. Afternoon at leisure with an optional visit to the Shiptons caves. Dinner and overnight at the camp. At 03h00, wake up and have some tea and biscuits. Start the hike of the scree to the point Lenana (alt. 4985m) which is the highlight of our trip! After taking photos with the amazing African sunrise we descend down to the Mintos Hut for breakfast. Relax at the camp and later descend further to The Meru Chogoria Lodge for dinner and overnight. Depart the lodge after breakfast walking through the thick bamboo forest to connect with a 4x4 vehicle to Chogoria town for our onward destination to Nairobi.